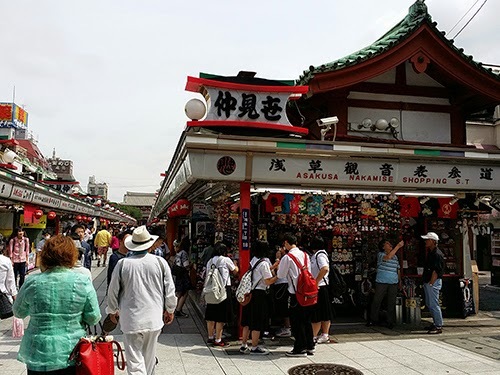 Asakusa area is known for keeping the old edo (former name of Tokyo) or the traditional neighborhood. I was able to book a capsule hotel that is 10 minutes away from Sensoji, a Buddhist temple which is the main attraction. There are maps available in the Tourist Information Center but I was lucky to have a guide while exploring Asakusa. 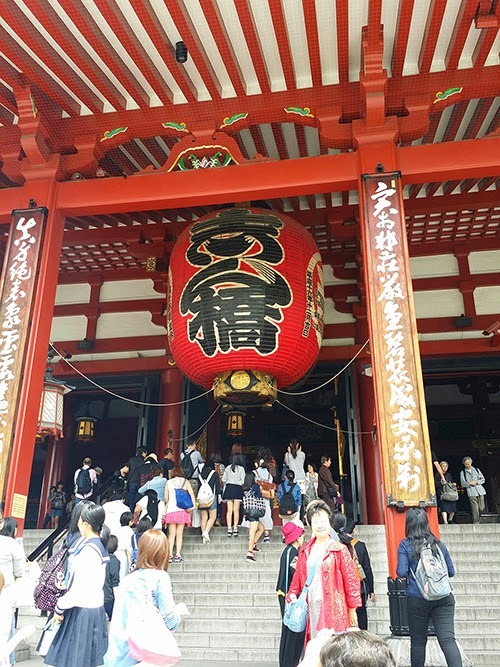 The Kaminarimon or Thunder Gate is the first large entrance that leads to Sensoji Temple. According to my guide, the gate is named from the two guardians - God of Thunder (Raijin) and Wind (Fujin). After entering the gate, I passed by the Nakamise shopping street that leads to the main temple. This is the perfect place to shop for omiyages or traditional souvenirs and even sample local snacks! I was full from free tasting everything when I reached the main hall. 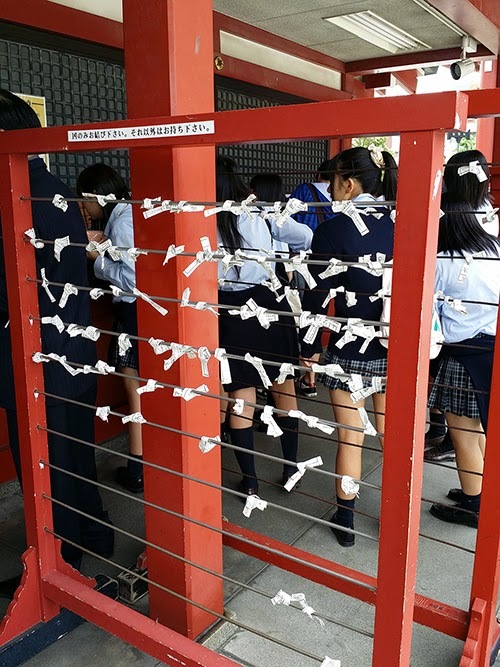 Metal rods and knotted papers - goodbye bad fortune! Before entering the main temple, we need to "purify" ourselves. 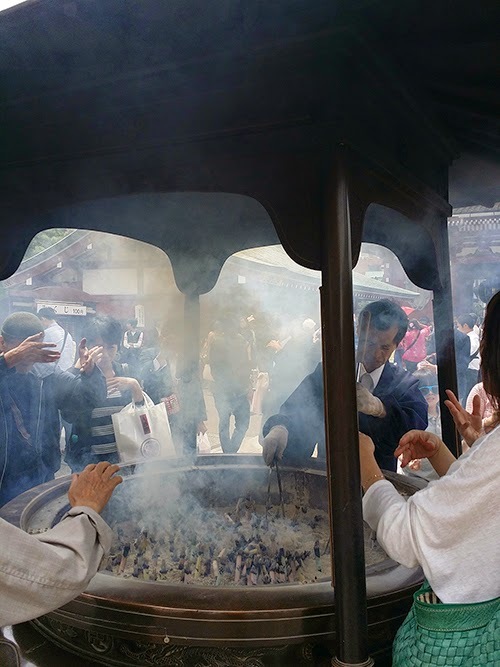 My guide provided the incense sticks that we used to bathe ourselves in smoke. Basically, we thrust the incense sticks on the huge bronze incense burner located in front of the main hall. By doing this, smoke covers our hands and faces and it signifies the smoke warding of illnesses before we climb the stairs to offer our prayers. 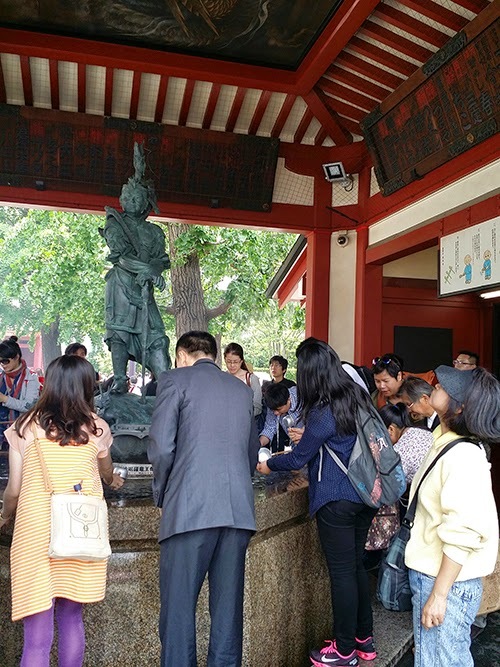 Every temple or shrine in Japan has a small fountain that is used for another type of ritual to purify. I held the ladle using my right hand to pour the water over my left hand. I switched the ladle to my left hand and poured the water over my right hand. I switched the ladle to my right hand again, then poured the water in my left hand, drank it, swished it on my mouth before spiting it to the ground. The last step is tilting the handle perpendicularly so that the water will run down the ground and clean the ladle before placing it back. 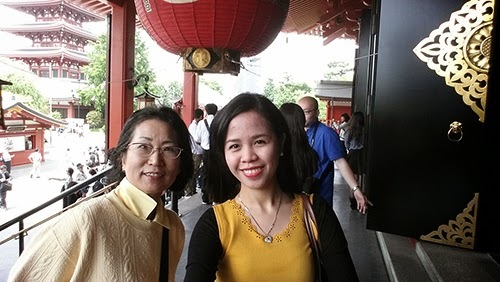 I've known Kumi through the Tokyo Free Guide site and it was a great decision to go to Asakusa with her. 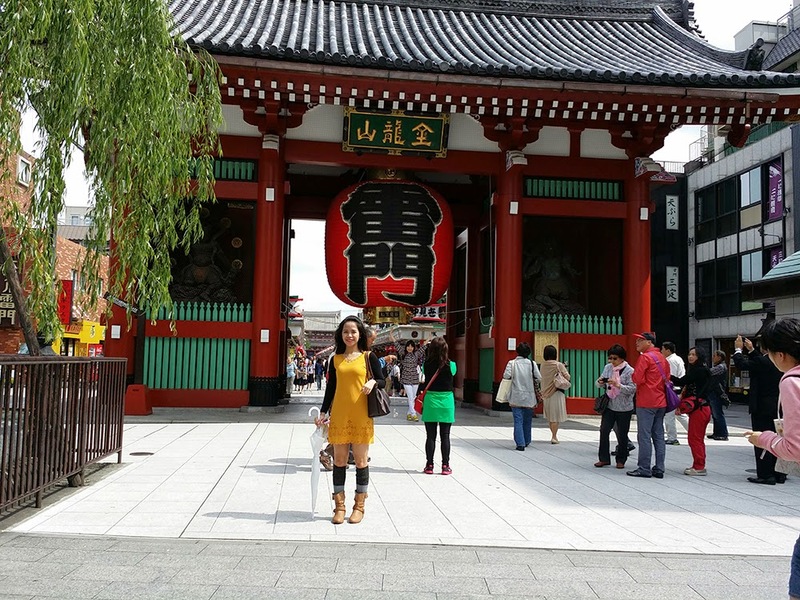 Asakusa can be easily explored by foot but without Kumi, I would've missed out on those purification ceremonies and trivias. She certainly, made the walking tour very educational but fun! I've spent several days exploring the Asakusa area. 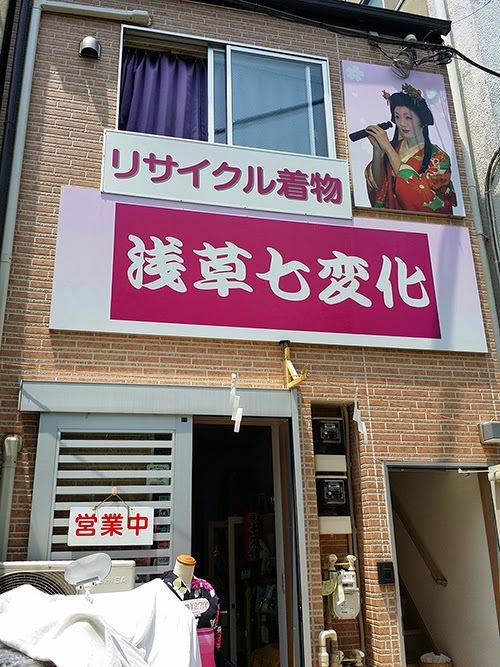 My second guide, Chiaki, booked a Kimono/Yukata rental for me on this store found on Dempoin Dori. I felt like a royalty while dressing up because 2 Japanese aunts were helping me out in wearing my yukata. 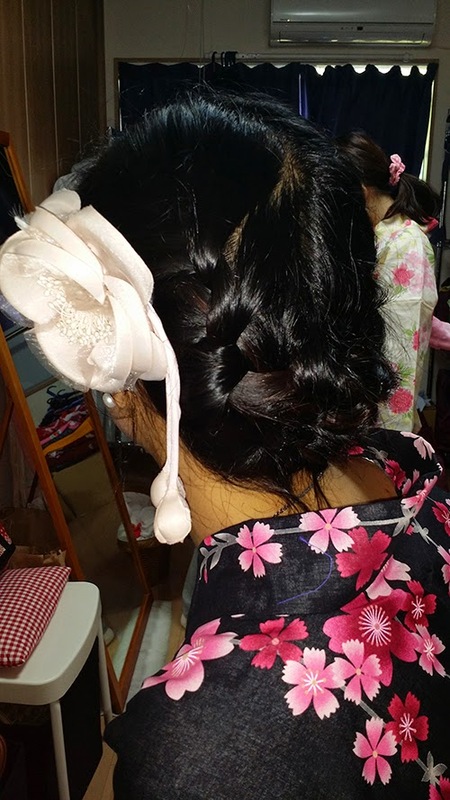 I originally intended to wear a Kimono but since its spring and the weather is warm, they recommended a Yukata. The main difference is that a Kimono is made of silk while a Yukata is made of cotton. First, they asked me to wear the socks because it will be hard to bend later. Then they helped me in wearing the "juban", a white cotton top and skirt. They carefully put on the kimono, its always "right side over left" for both men and women. I was just standing the whole time while spreading my arms on the sides. They adjusted the length of the kimono so that it ends on my ankle before finally tying the "koshi himo belt". They also styled my hair and let me pick a bag. 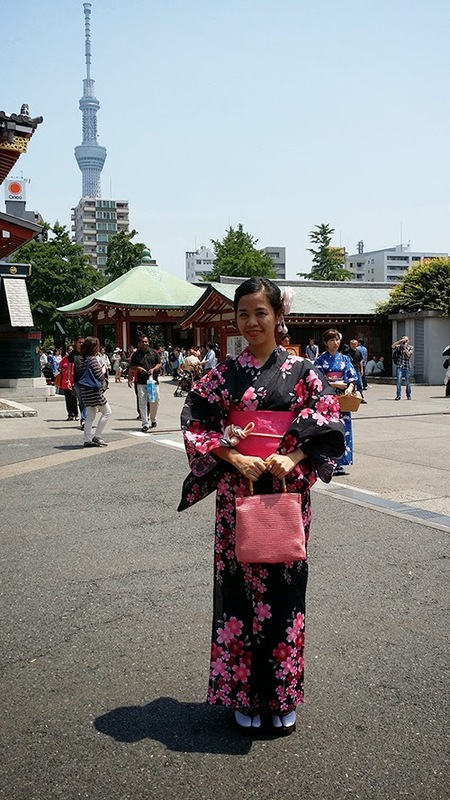 My Cherry Blossom themed Yukata, with Tokyo Sky Tree on the background.